Unknown Pyracantha, it was here on the house we rent in chandlers ford when we arrived here and the great looking berries are the reason it’s still here, pain in the backside to prune it back and shape it every 3 weeks, the flowers are beautiful but stink but the berries oh the berries! 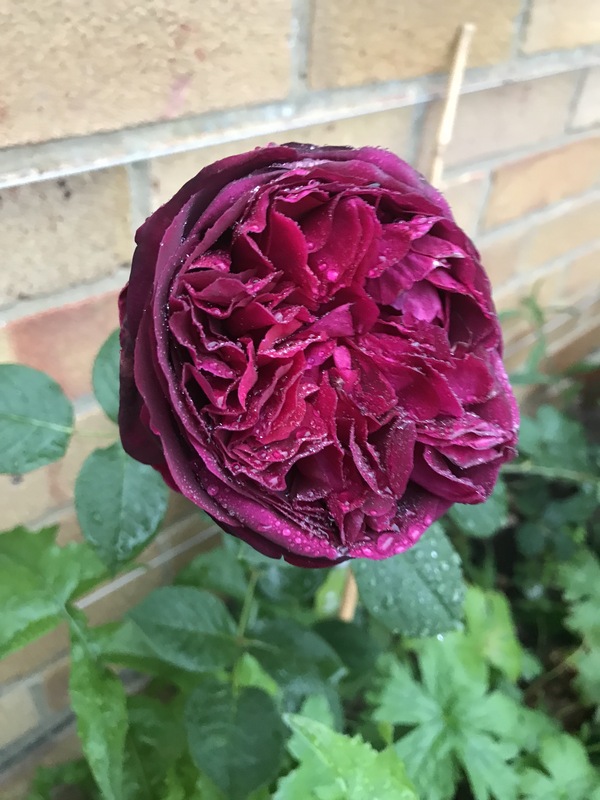 Rosa falstaff is one of my top David Austin hybrids, the flowers shape and scent remind me so much of an Heritage rose, this one was planted in the spring and really struggled to get going, then about 6 weeks ago it started growing and rewarded me with three flowers! Growing it as a low climber on my wall but makes a good shrub rose. Edgeworthia is such a wonderful shrub. I planted one beside our front door, where it is watered by run off from the driveway, and it has become one of the most impressive shrubs in the garden. The only problem is that in the last couple of years, birds have started picking at the buds during the winter. Very frustrating to find piles of white confetti under the branches. Agree – falstaff is lovely! Falstaff is terrific. I grow it as a climber over an arch. It has the most fantastic perfume and will flower a couple of times a year when established. Great choice! I have a Pyracantha that produces orange berries. I also have an abundance of blackbirds. So I have no Pyracantha berries. Oh well….